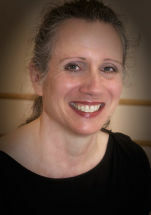 Nina Jonson joined the faculty of The Raleigh School of Ballet in 1994. Ms. Jonson holds a B.F.A. in dance from the University of Utah. Her training includes work with Yvonne Chouteau, Patricia Wilde, Valentina Pereyaslavic, Marjorie Tallcheif, and Rosella Hightower among others. Ms. Jonson performed with Ballet Oklahoma and the Jackson Ballet, and for five years prior to moving to Raleigh, she taught ballet and pointe in the Fairfax County Class Etc. program. In 2001 and 2002, Ms. Jonson became a certified Pilates Instructor.